Ports Thoughts: What a weekend! 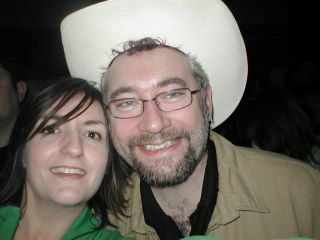 So following the awesome Losers gig, I had an excellent day on Friday. I met with a business partner at IBM's South Bank office and we spend a good 3 hours setting the world to rights. Between us we had over 20 years of Lotus experience so we were very much on the same wavelength. And it is very nice when a business meeting begins with you being wished Happy Birthday. 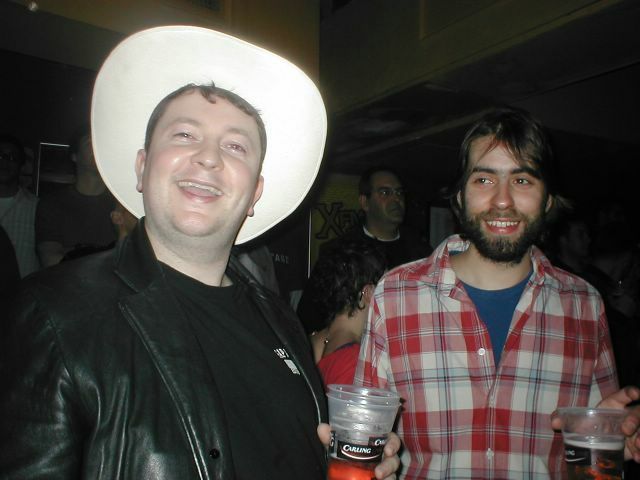 That night I had a great Birthday bash. A dozen or so friends came round to our house and drank stupid amounts, listened to cheezy music and ate a wicked chilli that Ali had cooked. Perfect. The next day my twin sister Ginny and my eldest sister Sue, brother in law Kev and nephew Jonny came round. Not a normal event because Sue, Kev and Jonny live in Leeds which is 230 miles away - but they had been down in London for the weekend. It was great to catch up with them even though I had forgotten to buy Ginny a present. I was made to look even more thoughtless when Ali came in with a present for Ginny. Doh! The next night (Saturday) we went to the Hayseed Dixie gig I mentioned a couple of days ago. These cats are really funny. They played so many great covers including "The Ace of Spades", "Highway to Hell", "Dueling Banjo's", "Whole Lotta Rosie" and " Lunch is all you need" (not a miss type). Here are a few photo's from the night. 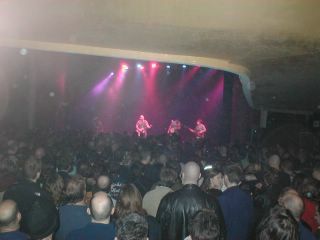 This is Hayseed Dixies on Stage at the Empire. They were brilliant. We were obviously quite far back - but that was cool because we were just next to the bar. This is me and Ali enjoying the Dixie boys. Ali didn't want to wear a Stetson because she had just had her hair done. This is Marcus and Tom . Marcus wasn't worried about his hair at all. 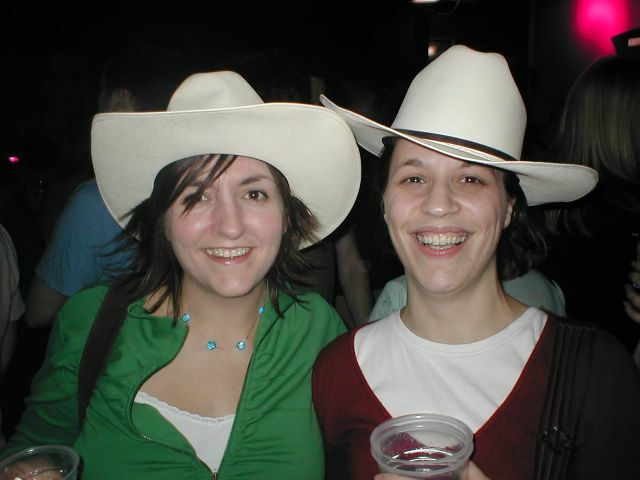 After a couple of beers Ali and Ellen had forgotten trying to keep their hair right and just wanted to be cowboys like the rest of us. Four fifth's of Sideburner, the band I'm in, were at the gig. And here we are. 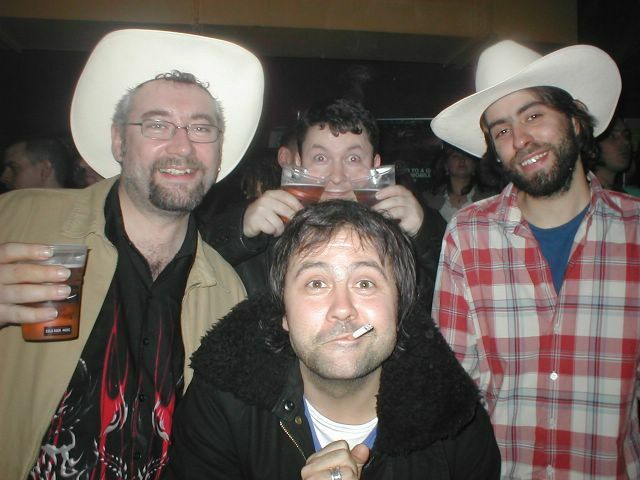 Obviously, Mr Ports, then lead singer Al (also of the Beautiful Losers), behind him Marcus with the two pints. And no, he wasn't holding them for anyone. He was drinking two to our one. And when we got a kebab after the gig he got two. Really. Finally Lightning Tom. @1 They didn't play any of those, Woody. I really wanted them to play "Devil went down to Georgia". But what they did play was really cool :-) Have a look here to see what they have on their latest album (currently UK Only) Let There be Rockgrass (link goes to Amazon).